Tiki Wonders is a NetEnt-powered slot featuring two progressive jackpots: Mega Wonder and Wonder. The Mega Wonder progressive jackpot has an average win amount of over €175,000 and the biggest recorded win of €181,000. To win a progressive jackpot you need to hit a combination of Star symbols anywhere on the reels. Getting 4 stars will award the Wonder jackpot, and having 5 stars on the reels will pay out the Mega Wonder progressive jackpot. There are no requirements on a bet size, yet the higher your stake, the more chances to hit the grand prize you have, the slot’s developer says. 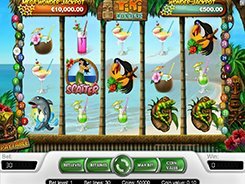 Tiki Wonders has a tropical island theme, and is played over 5 reels and 30 paylines. A bet comes in a range from $0.01 to $60 per spin which makes Tiki Wonders a very affordable slot. There is a wild symbol in the game that substitutes for all symbols except for the scatter and pays out the largest fixed jackpot worth x10,000 times a line bet, for five of a kind. Besides, a scatter symbol unlocks 10, 20 or 30 free spins with all wins trebled during the feature.